Tekken - Nina Williams "Bishoujo"
Kotobukiya's lineup of the beautiful ladies from the Tekken video game series continues with the Nina Williams Bishoujo statue ! One of the most attractive and stylish (and lethal...) female characters in gaming. Tekken is an arcade fighting game franchise created and developed by Namco. Beginning with the original Tekken arcade game released in 1994, the series has then received several sequels. Nina Williams is a fictional character from Namco's Tekken fighting game series. A cold-blooded Irish assassin, Nina made her first appearance in Tekken, the original game in the series, and is one of three playable characters and the only female character to appear in every installment in the series. This "Bishoujo" version is based on a new character illustration realized by the famous Shunya Yamashita, Nina looks now prettier than ever ! Nina wears her combat suit, standing on one leg while preparing a side kick to an oppononent sneaking up behind her. With her athletic physique and her beautiful Bishoujo style face, Nina makes a great display for both Tekken fans and Bishoujo collectors ! 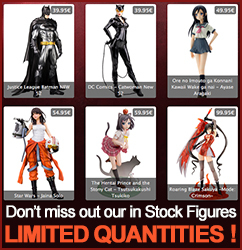 Display alone or alongside other Tekken Bishoujo statues from Kotobukiya ! TEKKEN TM TAG TOURNAMENT 2＆© BANDAI NAMCO Games Inc.